Born on September 10, 1942, in Rock Island, IL, Patricia Ann recalls that during the 4th grade at Sacred Heart Parish Grade School, she thought of her future. “I wanted to be a Sister, nurse, or a teacher and help people,” she stated. Time would tell how this would evolve. As she prepared to graduate from high school, she was happy to learn of her acceptance to St. John’s Hospital School of Nursing, Springfield. Although miles from her home, the Mulkeys were familiar with the school as an aunt and two cousins were graduates. So on July 26, 1960, Patricia Ann began classes at St. John’s and promised to keep in touch with her boyfriend, who remained in Rock Island. But God had other plans. 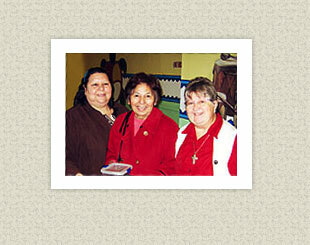 “I thought more and more about religious life and admired the Sisters. Their example at the school and service to people in need really impressed me,” she recalled. “So when I went home for Easter, I told my parents of my decision to be a Hospital Sister of St. Francis. My mother cried. My father was secretly proud. My brother and sister were excited. As for my boyfriend, well, he said that he ‘couldn’t compete with God,’” Sister Patricia Ann said. And the rest is history. She has had a most interesting life of service since making her First Profession in 1964. From nursing to music ministry, campus ministry to teaching, she has brought life to her 4th grade career path. “All my assignments were in response to a need, and I’ve learned so much,” she stated. “I was a 1960’s kid, and it was at this time there was a movement in our country for peace. As a result, racism was blown wide open, and I, along with so many others, realized how it was a sickness against everything that God wanted us to be. We should love one another, and yet so many among us were discriminating against African Americans, Native Americans, Asian Americans, and so many others for years,” she explained. She has taken an active role in working with the Native American Indian community. “Education is the best way out of poverty and into leadership. I encouraged people who were down on themselves to be motivated in reaching higher. People I worked with realized that they were recipients and ministers of the universal church, and now they can serve the community, she said. Her work at the Anawim Center, Chicago, has enabled her to listen and respond to the needs of the Native Americans and others in Chicago. “I’ve encountered street people, alcoholics, drug addicts, even the very together and economically-comfortable people, and have shared with them a common message: we are all brothers and sisters,” she said. Sister Patricia Ann holds a bachelor’s degree in nursing from Marillac College, St. Louis, MO, and a master’s degree in liturgical studies from the University of Notre Dame, Notre Dame, IN. She also has received advanced theology and pastoral studies from Boston College, Chestnut Hill, MA, and Loyola University, Chicago, IL, along with a certificate from the Institute for Spiritual Leadership, Chicago. “If I can share one bit of wisdom, it’s this: show respect for others, and don’t think that we have it all and they have nothing. Try to immerse yourself in something new and meet people who have a different skin color, culture, or religion. God really wants us to be peacemakers, and the best way to do that is to be open to others and not judge,” she added. In 1955, Sy Miller and Jill Jackson wrote a song about their dream of peace for the world and how they believed each one of us could help create it. They first introduced the song to a group of teenagers selected from their high schools to attend a weeklong retreat in California. The teens were purposefully from different religions, racial, cultural and economic backgrounds. The teens joined hands, formed a circle and sang “Let there be peace on earth and let it begin with me.” Like Sister Patricia Ann, may we be inspired to live by these words.